Then, because that shot took a long time to make, or was hard, even though it’s a bad shot, they feel like they can save it by making it into a black and white. But taking a bad shot and turning it black and white isn’t making it any better, it’s just making a bad black and white shot. You need to start with a good foundation, also known as a good picture, before you can change it. And getting it right in the camera is key. It’s like at my daughter, Tenley’s club basketball games. There are girls there who think they can make a baseline to baseline pass a la WNBA star Diana Taurasi, but they’re eleven years old, so the first kid gets the rebound, the second kid runs down to the opposing basket, while the first one whales on the ball as hard as their little muscles can, which means about ten feet, usually right into the hands of the other team. Even though in their minds, the ball should have made it, they don’t have enough power to make it down the court. . What the girls need to do is pretty obvious, even to us out of shape layman bystander parents in the stands. They need to know their range, and make precise passes. Same thing with a photo that you’re thinking of turning to black and white. Photos that don’t have power, or impact in color will turn out pretty flat in black and white. Choose what you’re going to shoot and why you would want to see it in black and white, then shoot it. This week, I had the privilege of shooting Marque and Sarah Garaux, yoga practitioners and teachers from Geneva, Ohio. 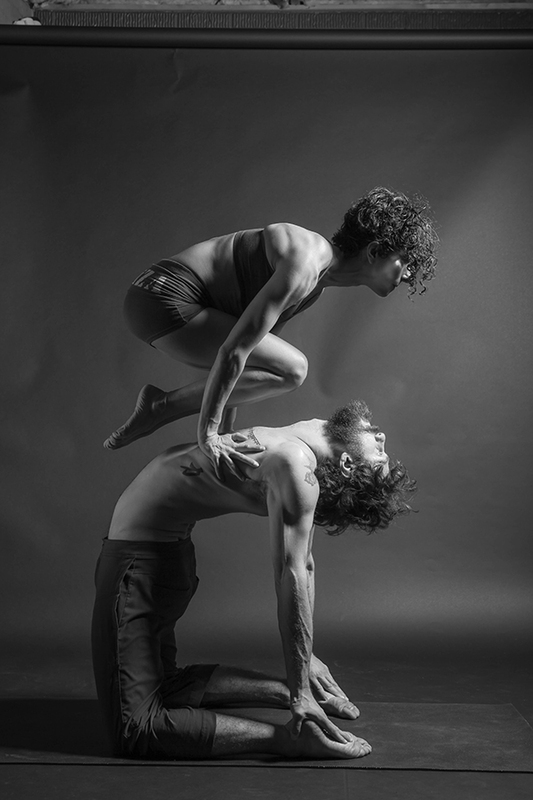 They are the most visually interesting people I have seen in a long time, in fact, I stole them out of my yoga class and had them come back to my studio to shoot these acro yoga shots for you. There are several elements of a photograph that make it visually interesting. Positioning of the subject within the photo is a big one, as is light, emotion, color (or lack of) and how the subject looks in a shot, also known as form. When any of these elements start to overpower the shot itself, turning to monochrome can help you focus on what the shot is about. If there is an interesting form or shape in the shot, or if the light is strongly defined, it might be a good candidate for monochrome. Hey, if your model’s body position looks amazing, that’s a great starting point. Then let’s go for the light. In this shot, I kept the bare bulb from camera left in, so that you can see where I had my rim light, and then put a beauty dish above Sarah’s face and at a 90 degree angle camera right to show her amazing muscles and shape. This is a type of cross lighting, and while it definitely isn’t for every shot, it is really good for strong subject definition. If you aren’t working with strobe lights, you can get a similar effect by shooting in a sunroom in the early morning or late afternoon where the subject’s head is away from the sun coming in, and the sun is coming in behind and toward the subject’s feet, or , if you just have one window, take several daylight balanced lightbulbs on one side and the window at the other. Experiment with making one light stronger than the other, and turning your model toward and away from the light. So you saw part of this shot earlier at the top with just Sarah in it, it’s lit well, their form is, well, incredible, but what really struck me about this shot is the love and trust between Marque and Sarah. She’s doing an incredibly difficult pose, held only by his feet in the small of her back, but look at the way he’s looking at her…there is no way he would ever let her fall. Their emotional bond enables, then surpasses the pose. It’s almost unbearable, and making it a black and white takes away any distracting elements and allows you to focus on the relationship. 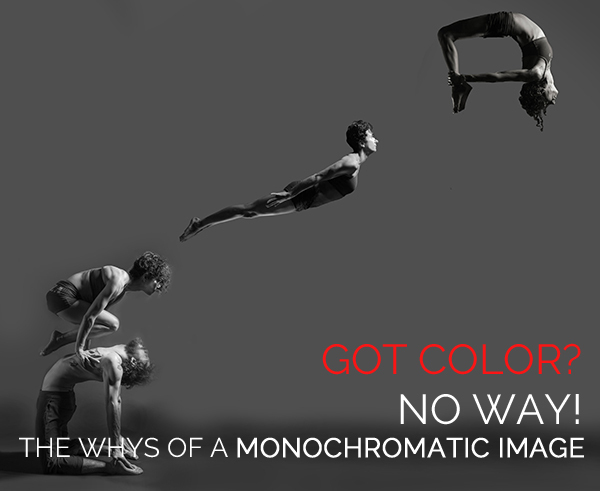 How do you make a color shot monochromatic? There’s no fixed way, but here are a few thoughts that you can try…The easiest thing is in Photoshop, you can start with Image>adjustments> black and white, then adjust the individual colors, or you can go to Image>adjustments> hue and saturation and move the hue and saturation bars up and down. You can use a preset in lightroom, or you can buy black and white action sets. My favorite is Craigs actions. Spendy, but awesome. So before you take your next photo, as in yoga, set an intention. What are you going to do that makes this particular shot black and white worthy? The great thing, is with the advent of the digital age, there is no guesswork; you have the immediate gratification of knowing what you shot immediately. So get out there, take some awesome black and white shots, and send them to me at barb@barbstitzer.com so that we can talk about them. Let’s get better together. Namaste.